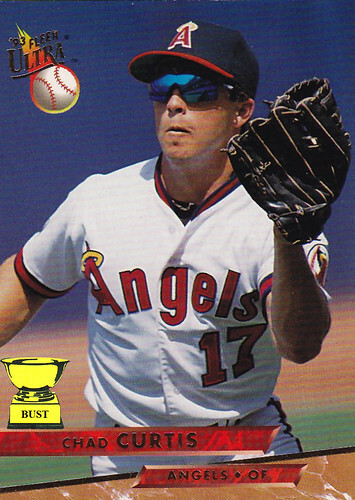 Make the catch: Chad Curtis was terrible in the outfield. He made so many mistakes, Fleer Corp. had no choice but to run a photo of him misplaying a fly ball. As you can see above, the ball is directed at an angle away from his glove's position. To make the catch, he'd need to drop his glove at least a foot. We understand the ball was hit hard — just look at the fire trail — but he's a big leaguer; he has to make that play. (What's that? Oh, the ball we're talking about is an illustration. Um. OK. Yeah, this is a bit embarrassing. So, that's not a real ball? Gotcha.) Folks, we've just been informed that Curtis isn't as bad of a fielder as we might have implied. Apologies to him and our readers.